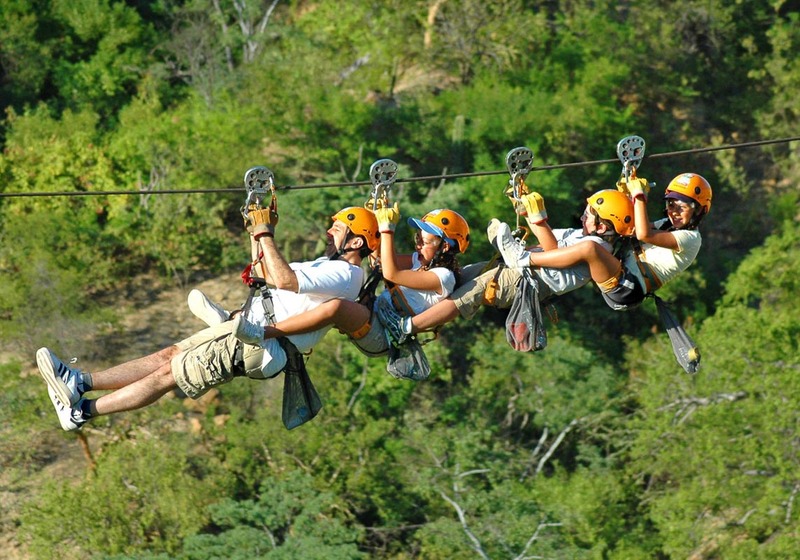 The Most Largest Zipline Tour in Los Cabos! Enjoy the Baja desert flying through its vast canyons with Monster Zipline. This tour is for real! We have 300% more line length than any other place in Los Cabos, and the highest possible ziplines thanks to a land area investigation we did at the point of the peninsula in order to find the best canyon for your ziplining pleasure which is at Wild Canyon! This famous canyon is found in a 100-hectare private property with its own unique flora and fauna including desert land, the sea, and an oasis. At our park our guests can see where our two bodies of water, El Cortez and the Pacific Ocean, unite. On our ziplines, our guests are hanging more than 300 ft above ground and zipping in total 2,673 feet (almost eight soccer fields long)! We offer best quality materials from around the world, and our staff are professionally trained from the greatest in the industry, therefore making our zip lines 100% safe. We make sure we offer the best and only the best: our cables are made of Swiss Steel, comparing to others who only have textile lines; and we count on an anchor concrete system that weighs 20 tons, allowing our ziplines can support up to 16 tons of weight. On some lines, our guests can have up to 4 people at a time which is a thrilling adventure to go on with friends and family. Come join us as we fly through our canyon, passing by boulders and looking down at the oasis from a birds eye view. Towards the end of the tour we invite you to come check out more of our park activites such as: our hanging bungee jumper’s platform, our hanging bridge “Los Cabos Canyon Bridge” where people pendulum off (at more than 1082 feet length) on our giant swing, and our birds and reptile sanctuary where our guests can feed our beatiful lovebirds, see our macaw birds do some tricks, or get close to our terrorizing crocodiles. Water bottle. Training and Induction. Lockers (with an ID, returned at exit). Free Round Trip Available. The tour price does not include the entrance fee to the park of USD per person. For their safety, pregnant women and people with heart, back or neck problems, as well as those with vertigo or osteoporosis won’t be allowed to participate in this activity.⁽¹⁾ Weight per person. ⁽²⁾ Line 1 through 7. on line 8. Max. Weight is 250 lbs. or 113 kg. No changes are permitted. Activities may be modified due to weather conditions. We reserve the right to change schedules without prior notice. No refunds can be made.Cancellation Policy:You may cancel your tour 72 hours in advance of the activity date for a refund, after this date any cancellation will be subject to 100% non-refundable fee.For cancellations:Please call Eko Park Los Cabos / Wild Canyon. 624-144-4433 or write to [email protected] for questions or to cancel the tour to avoid full charges. You must obtain a cancellation number. Eko Park Los Cabos / Wild Canyon won’t refund if for some reason in the park you decide not to do the activity. More information in our Terms and Conditions. El mejor tour de tirolezas que puede existir en Cabo! Una gran experiencia que no se puede comparar.